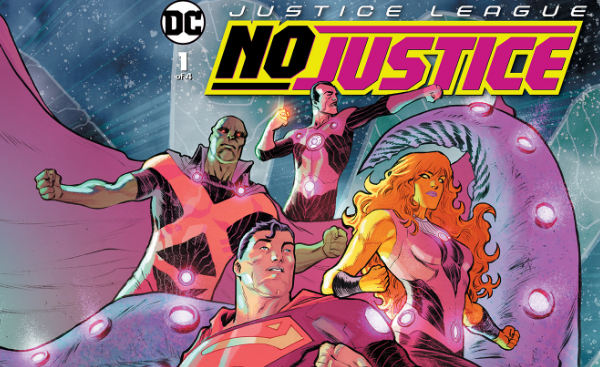 With the DC Universe deconstructed after the events of Dark Nights: Metal, DC Comics has released a preview of the upcoming four-issue miniseries JUSTICE LEAGUE: NO JUSTICE #1. The comic features a superteam of characters and creators alike. Check out the press release below and preview pages of issue one. "DARK NIGHTS: METAL left the DCU transformed in ways both terrifying and wondrous—and only the Justice League is strong enough to face the threats to come…or are they? Four giant beings comprised of the universe’s major energies—Mystery, Wonder, Wisdom and Entropy—who sustain their life force by devouring planets are on their way to destroy the planet of Colu. The only way to take down this unimaginable threat is for the superhero teams of Earth to forget everything they thought they knew and form new alliances. 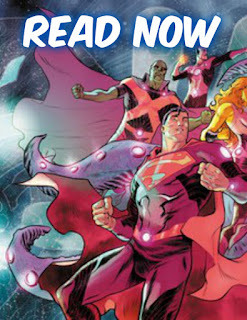 In this kickoff issue to the four-issue miniseries, after Brainiac systematically takes down all of Earth’s super-teams, the last thing the League expects is for him to ask for their help! Without their aid, his home planet and the universe are both doomed!"